When I first cracked open the core set, I seriously under-estimated beravor. 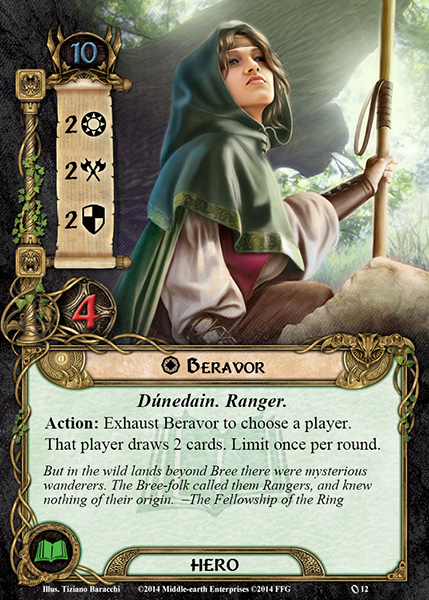 "Glorfindel can Quest and attack better, Denethor is a better defender, and her card draw uses up her action," I thought. But she's an amazing glue hero and she'll never be twiddling her thumbs. Very good hero. Beravor is great hero, with great stats and ability, which is good enough for the threat cost. She can be useful in any deck as glue hero or defender, best to put Unexpected Courage on her, to be able to use her twice in round. Amazing artwork. Verdict: 5/5.